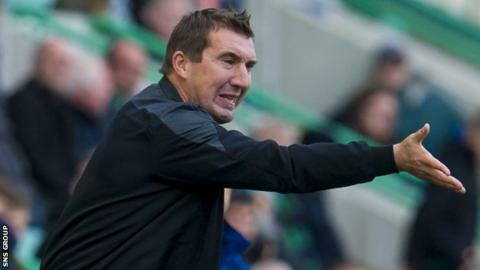 Manager Alan Stubbs believes Hibernian are making significant progress after a challenging start to his first senior coaching role. The Easter Road side are unbeaten in six games but trail Championship leaders Hearts by 14 points following Sunday's Edinburgh derby draw. "It was never going to be giant strides but I feel as if we've come a long way in a short time," said Stubbs. "I feel like I've learned three years' worth in three months." Former Everton and Celtic defender Stubbs, 43, replaced Terry Butcher in the Hibs dugout following the club's relegation from the top flight. However, a month had passed between the play-off defeat to Hamilton and Stubbs's appointment. In his short time in Edinburgh, Stubbs has overseen an overhaul of the squad and coaching staff, with teething problems as the team lost five of their opening eight games. "Over the last couple of months we've started to perform better," Stubbs told BBC Scotland. "We did have a stumbling start to the season. "But when I first came in I didn't have any staff, I hardly had any players and I had to prepare a team for a Championship challenge in six weeks. It was difficult." An injury-time goal from 10-man Hearts on Sunday made it three home draws in a row for Hibs, who are fourth in the league, three points behind Queen of the South. "Easter Road has been an intimidating place, and, rightly or wrongly, the players have to take a share of the blame for that," said Stubbs of the poor home form that has afflicted the club in recent years. The last four seasons in the top flight yielded just 18 victories in front of their own fans. "Sometimes it can be very downbeat," added Stubbs on the atmosphere. "Even when you do something well there can be a negative slant on things. "But you have to move on. You can't do anything about the past but we have a chance of changing the future. "We have to keep getting results and I know in the past the results have not been good enough." Hibs go into Wednesday's League Cup quarter-final at home to Dundee United having conceded just three goals in their six-game unbeaten run, which included a 3-1 win at Rangers. And while Stubbs was frustrated to lose such a late goal to Hearts, he insists his players will be buoyed by a good display. "Our performance on Sunday has given us a huge amount of confidence," he said. "They knew they got out of jail with that strike. We had them on the ropes."